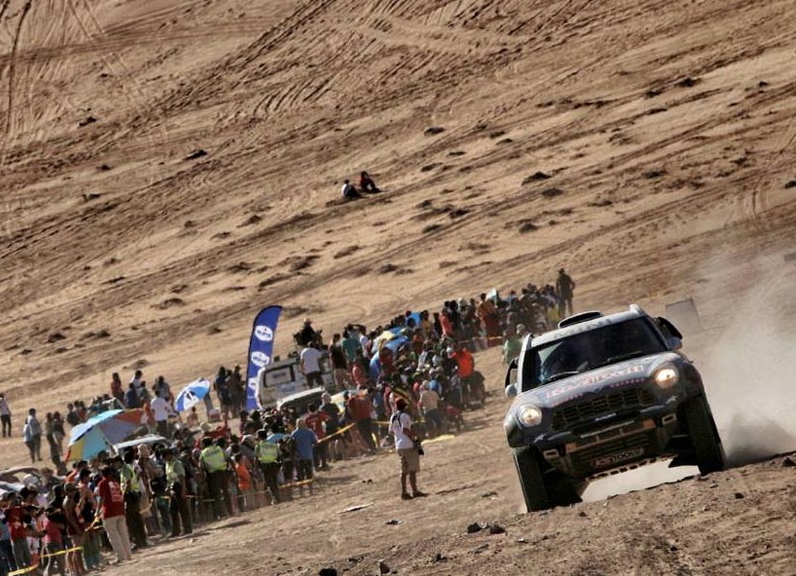 Dakar 2015 entered Chile, after a long connection of nearly 600 km, crossing the Andes at 4800 m attitude. Then, the competitors jumped into 4th stage directly in the dunes of Atacama desert. After spending most of the stage hot on the heels of Marc Coma, Joan Barreda turned on the afterburners to overtake his closest rival in the final kilometres and clinch his second stage win in Dakar 2015. Even more importantly, the HRC rider holds a sizeable lead after just four days of racing. Much of the same for Nasser Al-Attiyah, who also made it two this year after a closely fought battle and expanded his lead. Joan Barreda had a comfortable buffer in the general classification in Chilecito yesterday morning, but it certainly did not dampen his appetite. The presence of Marc Coma, a fast veteran, in his sights put the Spaniard in the ideal position to set a blistering pace and put time into the rest of the field. With Barreda’s fighting spirit, merely shadowing his KTM rival was never an option, and a late surge was enough to earn Joan a second stage win in the Dakar 205 and deal Coma a severe blow. However, the four-time Dakar winner knows there is still lots of racing left and is set to fight back from the very next stage. Paulo Gonçalves faded on Wednesday to concede a quarter of an hour, seemingly unable to compete with his teammate, just like Ruben Faria, who lost eleven minutes yesterday and now lies 23 minutes back in the general classification. 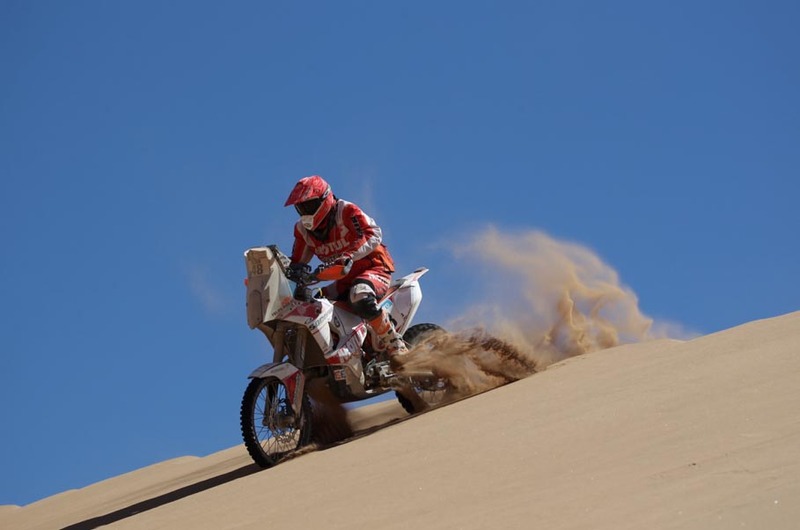 Jordi Viladoms, fourth in the stage, also lost over 10 minutes and now sits in fifth place overall, whereas Pablo Quintanilla signed an amazing performance as the Dakar came to his homeland in Chile and climbed up to sixth place in the general classification. 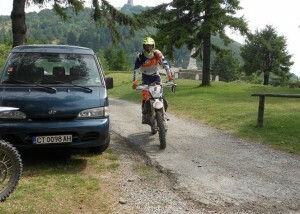 Rookie Matthias Walkner was the big loser of the day, conceding 23 minutes and falling off the provisional podium. Laia Sanz, on the other hand, had good reason to be cheerful after finishing an excellent eighth. He’d been second. He’d been fourth. He’d been third. Winning a stage was all Rafał Sonik needed to cap an amazing start to the Dakar 2015. 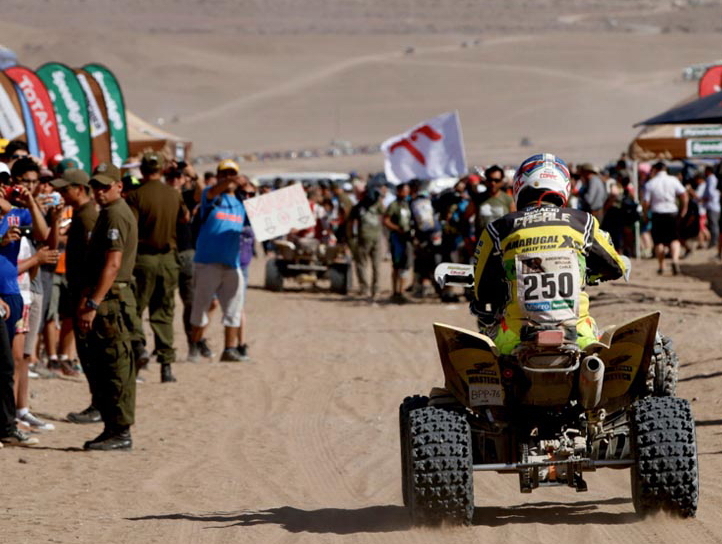 The Pole, who started the stage in the overall lead, claimed one of his finest victories in Copiapó and expanded his lead after a stunning performance. Ignacio Casale, the only rider who came anywhere close, conceded 3:26 minutes. Mohammed Abu-Issa finished Wednesday’s stage over 13 minutes behind the winner. Nasser Al-Attiyah spent the entire stage in the leading group, only to make the difference on the last dunes of yesterday’s special in true champion style. The Qatari is having a fantastic start to Dakar 2015 and seems to be in his element whatever the terrain. Like a good omen, it was none other than his teammate and 2014 winner Nani Roma who broke his streak of bad luck to finish second, 2:40 minutes back. The Spaniard is no longer a general classification threat, unlike Giniel de Villiers, whose consistency at the wheel of a Toyota Hilux since the start in Buenos Aires has kept him within striking distance of the official Mini driver. The South African, eight minutes down on the leader, is the only driver close enough to unsettle Al-Attiyah. Behind him lies the surprising Yazeed Al-Rajhi, who once again charged full steam ahead to put himself on course for a podium spot at the end of his first Dakar. Stéphane Peterhansel held the lead at CP5, but he let victory slip away after jumping over two metres high and suffering a flat tyre. 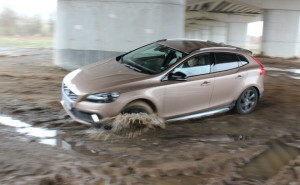 However, he proved Peugeot is competitive by finishing 5:48′ behind the winner. Teammate Carlos Sainz was not as lucky. 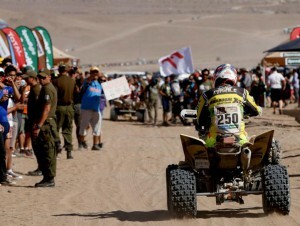 Forced to stop for several hours due to a mechanical problem a mere 30 km into the special, he no longer is in a position to challenge for the overall winof dakar 2015. Orlando Terranova, who started the stage in third place, also saw his dreams go up in smoke after having to stop at km 52 of a stage which put paid to the plans of several favourites. Robby Gordon also lost over an hour between Chilecito and Copiapó. 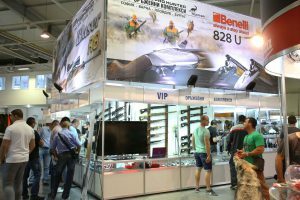 In the truck category, Eduard Nikolaev was the fastest truck driver, while Kamaz made 1-2-3 onto the stage, as well as in the general standings. But on the top there is Ayrat Mardeev.